The next time you’re in an art museum and you happen to see a painting depicting astronomy or astronomical instruments and diagrams, you might want to take the description with a grain of salt. Sara Schechner has been working with an art historian to interpret a 16th century painting of astronomy, and has found that sometimes these illustrations can feature telescopes “pointing to the ground” or be “nonsense diagrams” that are “not Ptolemaic, not Aristotelian, and not Copernican–just a bunch of circles and lines.” The project has been eye-opening and fascinating for her but is just one of the many things she divides her time on. Schechner is the David P. Wheatland Curator of the Collection of Historical Scientific Instruments, a Lecturer on History of Science in the History of Science Department, and a member of the faculty of the Museum Studies program at Harvard University. This year she is also the winner of the HAD Doggett Prize, which is awarded to individuals who have influenced the field of historical astronomy over the course of their careers and which she has served on the committee for herself in the past. She has also been chair of the Historical Astronomy Division. Schechner is the first woman to get this prize. 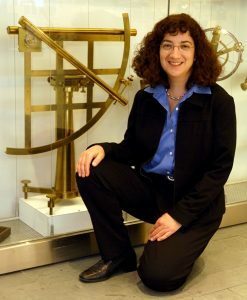 Her plenary talk, titled “The Tangible Things of American Astronomy,” will look at historical objects as a way of understanding the evolution of astronomy in the US. With every new discovery, the technical advancements in science are easy to see, but in both her personal experiences and her research, Schechner has been witness to the social change and its effects on astronomy. Ads for telescopes in Sky and Telescope from the 1960s, for example, show “women dressed in high heels and a kind of cocktail dress, draped over telescopes.” The image might seem out of place in a copy of the magazine now, but she draws an analogy between this and today’s car models. Likewise, when she was an undergrad at Harvard-Radcliffe, Harvard and Radcliffe were still separate schools, and the number of women admitted to Radcliffe was far smaller than the number of men admitted to Harvard. Schechner originally started out studying physics, but she was always interested in learning about the context of science and was taking a history of science classes as well and graduated with degrees in both areas. While she enjoyed both, in the end, she chose to get a PhD in history of science over physics because “frankly it was so toxic for women in astronomy back in the 70s and 80s that I decided I didn’t want to beat my head in a wall there.” As an undergraduate, she encountered professors that would tell her she should be “baking cookies” when she tried to go to their office hours. As a graduate student at Harvard, she worked with Owen Gingerich and I. Bernard Cohen. To learn more about Sara Schechner’s work and about the interplay of society and science, check out her talk on January 9, 2018, at AAS 231. I'm a 4th year graduate student in astronomy at Johns Hopkins. I work on observational cosmology, specifically getting distances from variable stars. I did my undergrad at Harvard, where I was a joint physics and astrophysics concentrator. I love traveling, cool weather, food, books, and Oxford commas.